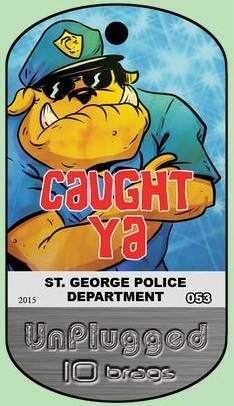 ST. GEORGE – If you are looking for a fun activity to keep your children busy and safe this summer, the St. George Police Department may have just the solution after partnering up with Play Unplugged Utah and offering a “Caught Ya” Badge. The Play Unplugged program is designed for parents to choose which Brag Badges to work on with your kids. When your child completes the activity, go to the sponsoring business to pick up the badge. Families can create rewards your kids “purchase” from their earned brags. A reward can be anything from money to a family vacation; you decide.